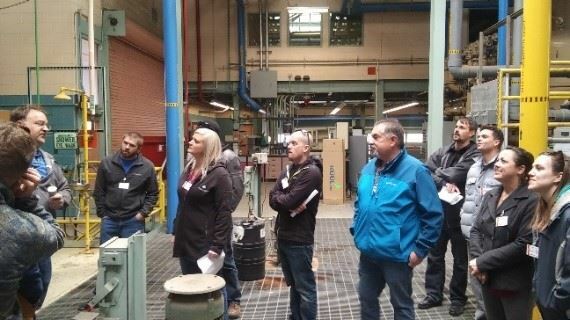 Committee(LPC) and RMWQAA toured the wastewater treatment plant at the Lockheed Martin Space Systems, Waterton Canyon located in Littleton, Colorado. 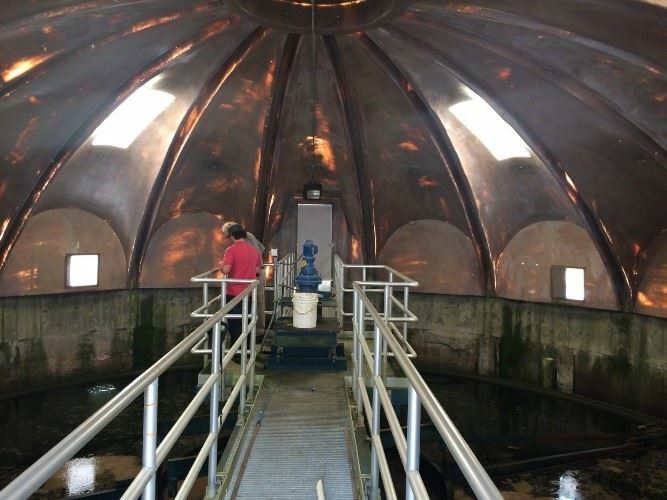 This treatment plant serves the 6200-acre facility with a rich history of industrial use. The site was first constructed in the mid 1950’s to build the Titan I intercontinental ballistic missile. Since the initial build, the company had experienced several mergers and different focuses and has been known as Lockheed Martin since 1997. Over the years, the plant has manufactured hundreds of rockets designed to carry missiles, and communications satellites into space. 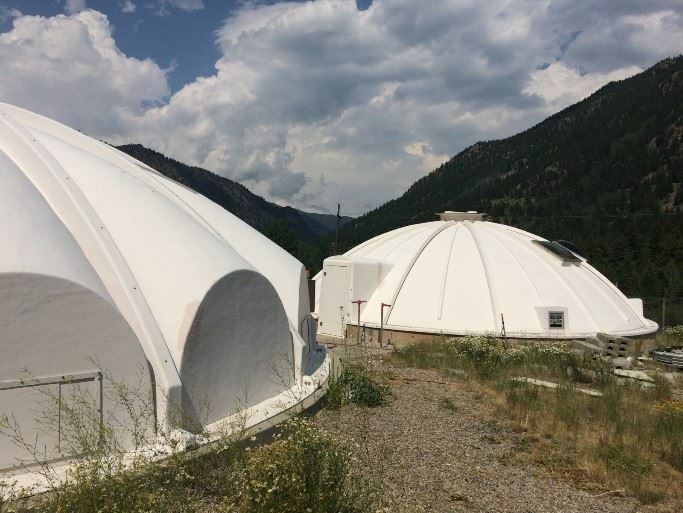 Crafts such as the Titan, Gemini, Viking, Voyager, and Cassini were all built at the Waterton Canyon facility. 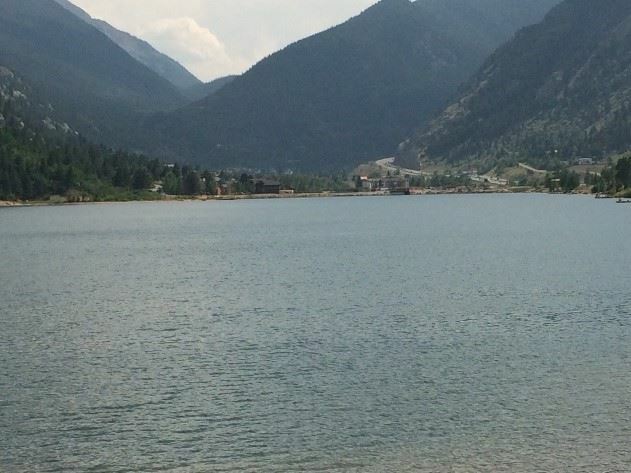 Waterton Canyon was chosen specifically because the natural geology of the area provided more security and noise control than other sites. In fact, the location tops a 1,700-foot-deep bedrock formation that isolates it from even the smallest seismic movement and provides the ultimate environment for testing the stability of various systems. Early years of rocket launch testing contaminated the soil and groundwater with rocket fuel and manufacturing chemicals. The EPA declared it a Superfund site in 1989, however, this designation was soon removed. Initial clean-up efforts included removal of contaminated soil, wells, and solid waste. Decades later the main contaminant remaining in the groundwater is N-nitrosodimethylamine (NDMA), which is a breakdown product of hydrazine rocket fuel. Lockheed’s industrial wastewater treatment plant is responsible for treating the groundwater as well as production waste from space component manufacturing processes. Domestic waste is collected and piped to South Platte Water Renewal Partners (previously known as Littleton/Englewood Wastewater Treatment Plant) where it is treated and discharged into segment 6a of the South Platte River. The NDMA contaminated groundwater treatment has been going on continually for the past 20 years. Luckily, the geography of the area funnels groundwater into two main channels making it easy to reclaim all of it for treatment. NDMA is treated via UV Photolysis where it’s degraded using high levels of UV irradiation. The Nitrogen bonds are broken leaving NO and (CH3-N=CH2). The NO then gets oxidized into nitrite and then nitrate. The dimethylamine oxidizes to form bicarbonate. The UV bulbs are similar to the bulbs used in domestic wastewater plants, but instead of having a group of bulbs in a grid, only one very high-powered bulb is used. Initial levels of NDMA in the groundwater were around 300 ppb. After 20 years of continual treatment, the levels have dropped to about half, and through treatment, they are able to meet their permit limit for NDMA. Other waste streams contain high levels of chromium and zinc from manufacturing or washing processes. Aluminum is etched off of casings of crafts to minimize the weight and fuel it takes to launch. Chromium plating is used to prevent oxidation. The metals are treated using hydroxide precipitation, followed by polymer flocculation. The sludge is then dewatered with a sludge press and dried for disposal. The final effluent water goes through sand filtration, Nitrite oxidation, carbon feed, granular activated carbon (GAC), ion exchange, and final pH adjustment. PFASs or per- and polyfluoroalkyl substances have become a growing concern over the last decade due to widespread use and persistence in the environment and in the human body. According to the ATSDR (Agency for Toxic Substances and Disease Registry), PFAS are man-made chemicals that have been used in industry and consumer products worldwide since the 1950s. The most common types of PFAS include perfluorooctanoic acid (PFOA) and perfluorooctane sulfonic acid (PFOS), however, there are many other forms which are not studied as well and used throughout the world. They can be found in non-stick cookware, water repellent clothing, stain resistant fabrics and carpets, firefighting foams, and products resistant to grease, water, and oil. The widespread production and use of PFAS contributes to its ubiquity not only in the environment, but also leads to its accumulation and persistence in the human body. Environmental exposure to PFAS could occur through multiple methods from contact with the manufacturing process, usage, and disposal of PFAS products. For example, surface water or groundwater and the surrounding soil becoming contaminated after receiving run-off in areas where firefighting foam was used. According to the EPA, human exposure can occur through daily usage of popular consumer products such as cookware, stain repellants, and even pizza boxes. A major concern with PFAS exposure is its persistence and ability to stay in the environment and in living organisms for a long period of time. As a result of repeated exposure, the amount of chemical in the bodies of humans and animals alike can accumulate and lead to adverse health effects. Researchers have been studying the adverse health effects in animal models to better understand how these chemicals cause toxicity and what organ systems are being affected. Studies indicate that the PFAS can disrupt endocrine activity, reduce immune function, and can cause adverse effects on multiple organs including the liver, kidneys, and pancreas (NIH, 2019). Epidemiological studies with humans, though limited, have shown an increase in cholesterol levels, cancer, and thyroid hormone disruption (EPA, 2019). Although more research is needed to fully understand the health risks and impacts of PFAS, actions have been taken to limit the exposure to these chemicals. The EPA lowered the non-binding health advisory limit for some PFAS compounds found in public water systems. However, because of the growing concern that these chemicals may cause adverse effects to human health at lower levels, further action was taken to reduce exposure in some states. 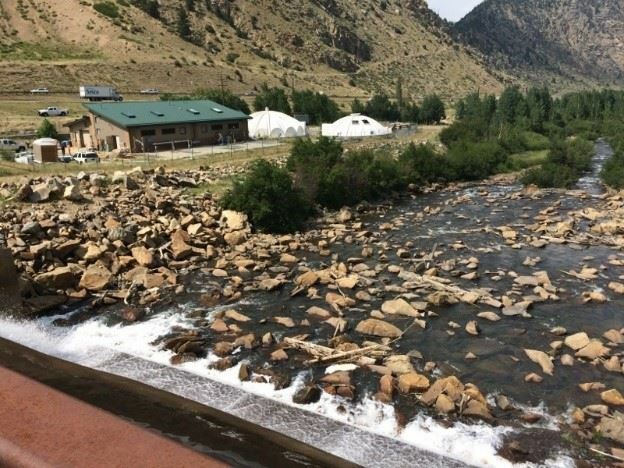 In Fountain, Colorado, the EPA announced the first-ever comprehensive nationwide PFAS action plan. 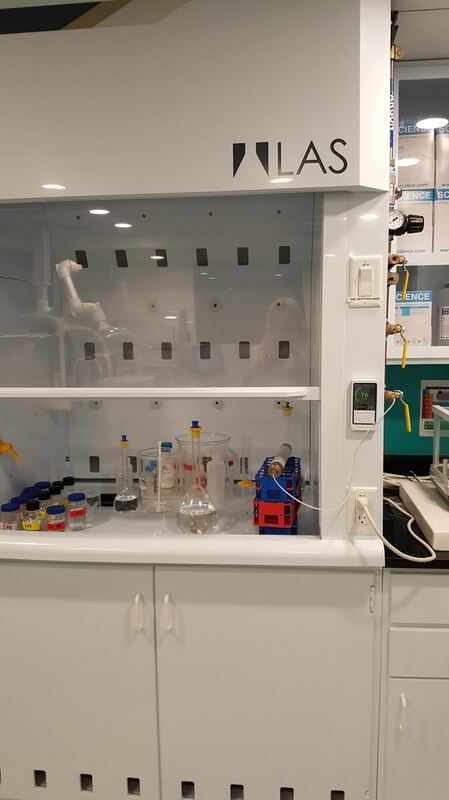 The plan consists of expanding PFAS monitoring in the environment, enhancing scientific research for addressing PFAS by developing new analytical methods and tools, and clarifying clean up strategies. Furthermore, two chemical classes of PFAS have been phased out of industry in the United States, PFOA and PFOS, and the EPA is working to list these chemicals as hazardous substances under the Superfund Program (ATSDR, 2018). Future strategies and regulations include recommendations in the clean-up of the persisting PFOA and PFOS levels in groundwater and expanding limitations to other chemical classes of PFAS. Ashley Romero is the Laboratory Manager at GEI Consultants, Inc. and has a background in ecotoxicology. February was a busy month for the RMWQAA with a brewery tour and participation in the Metropolitan State University of Denver's Water Career Fair. 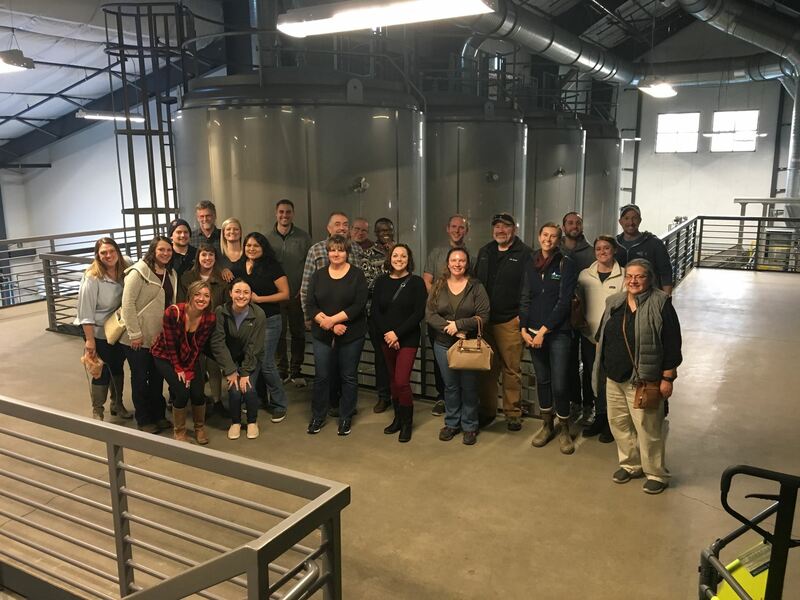 The Breckenridge Brewery’s Littleton campus hosted a group of nearly 30 analysts for a FREE, fun-filled tour of the beautiful brewery and tasting room. After having all our questions answered by the tour guide and laboratory guru, we wrapped up in the restaurant with a rousing game of telephone. Just as much fun as elementary school with pink pigs flying! Five RMWQAA members manned a booth at Metro’s water career fair on Tuesday February 26th. RMWQAA flyers and handouts summarizing other resources for water careers were provided to attendees. Many students stopped by the fair to chat with our RMWQAA leaders about their jobs in the water field, promoting the value of water careers. Don’t miss out on future RMWQAA and RMWEA-LPC sponsored events! There are still open spots in the upcoming Lockheed Martin Tour. Sign up today!! Do you know your DOC? 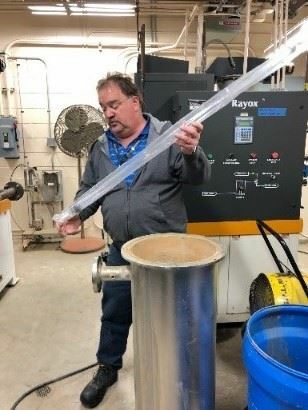 Dissolved Organic Carbon is one of the key water quality components affecting aluminum toxicity and the EPA has taken DOC into account in the newest version of the aluminum criteria. The EPA read through hundreds of comments on the draft aluminum criteria and has made significant improvements over the previous 1988 version that reflect the newest science. The new criteria was only published this month and it will be a while before Colorado and other states fully adopt the new criteria. The EPA has created a tool to help dischargers calculate the aluminum criteria for their site. 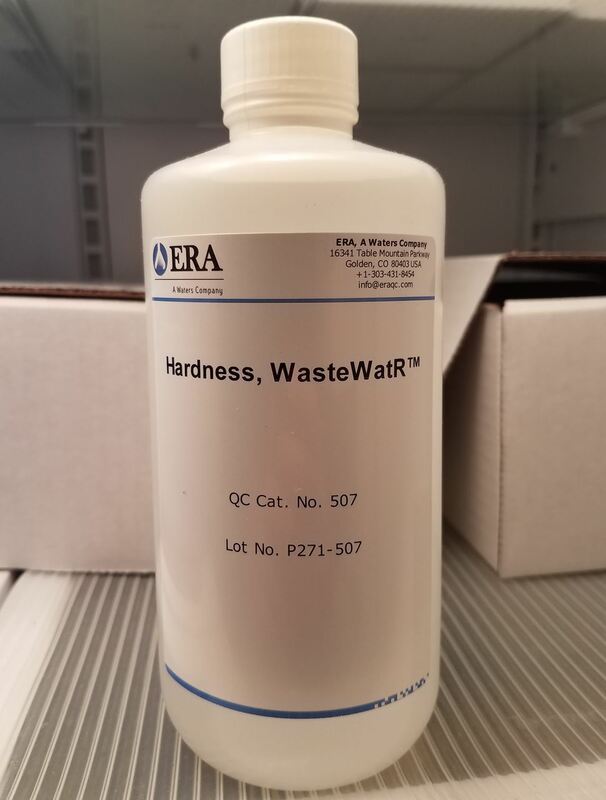 All you need are the pH, hardness, and DOC concentrations for the receiving water and you can find out the expected new aluminum criteria for your site. So get out there and collect your data now so you can be prepared when the new criteria are implemented in your state. Click here to read the full aluminum criteria document. These days drones are everywhere in the news….drones surveying landscapes, drones taking pictures, even drones delivering pizza. At a recent conference, drones were again at the center of the conversation, but this time, the talk was about drones collecting water samples. For anyone who has spent a day launching a boat, and fighting waves, seagulls, and other hazards, the idea of drones doing all that work for you sounds pretty good. While there are numerous benefits to drone sampling, there are significant costs associated with it too. Let’s start with the positives. Drones can provide an excellent tool for reaching hard to access waterbodies. Much of the drone water sampling currently is at pit lakes at mine sites where access to the water’s edge is risky. Drones allow personnel to work safely, well away from the water’s surface. Another benefit is the ability to collect samples at numerous depths using Kemmerer or Van Dorn-type samplers. 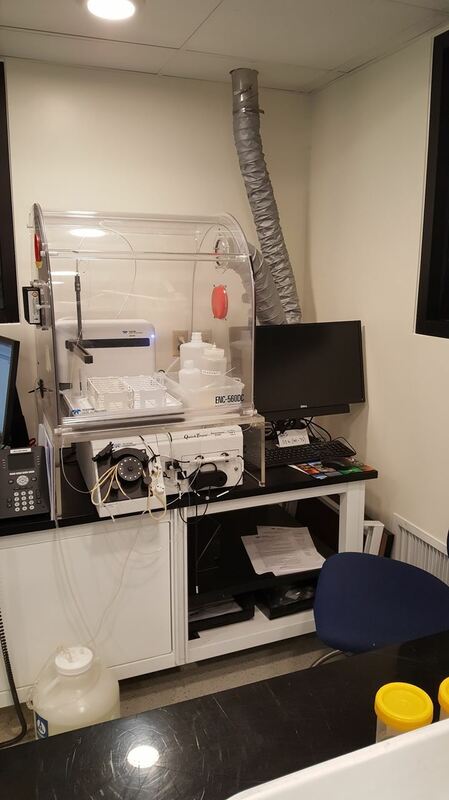 This allows the sampler to get the same quality data from various depths without being in unsafe conditions. Drones can even be fitted with probes that collect a full suite of standard water column profile data such as depth, pH, temperature, and conductivity. Even though the upfront cost of a drone sampling system would be high, in the long run, the savings would likely be made up in personnel costs. Typically, launching a boat requires a minimum of two people for safety reasons, and unless the boat is permanently in the water, getting the boat to the site, launching, and all the required sampling can be quite time consuming. Drones can save a significant amount of time by simplifying the entire sampling process. Drones aren’t for everyone. They do require licensed pilots and many flying restrictions such as keeping the drone within your line of sight and avoiding certain airspace, makes them infeasible for some sites. Battery power is also still a limiting factor. The standard flight time when carrying heavy loads of water can be as short as 15 minutes, meaning numerous sites may not be sampled in a single day without battery replacement or recharging. As the temperatures drop, you might be imagining piloting a drone from the warmth of your car, rather than sitting in a cold boat, hoping you don’t get splashed. Unfortunately, if high winds or fog are present, the drone may be grounded and you’ll be stuck sampling the old fashioned way. Despite the drawbacks, drones are allowing samplers to work in much safer conditions than ever before. As long as researchers continue to think up new uses for drones, we may one day be able to stay cozy warm while lake sampling is still getting done. Natalie Love is the Laboratory Director at GEI Consultants, Inc. GEI conducts Whole Effluent Toxicity (WET) Testing, low-level nutrient analysis, and benthic macroinvertebrate identifications. She lives in Denver with her husband, 2 daughters, and mastiff. Water conservationists and a Native American women's advocacy group believe they've found a potential solution to a massive, decades-old underground plume of toxic chromium that likely has spread from property owned by Los Alamos National Laboratory to San Ildefonso Pueblo land. "Conventional remediation strategies are inherently harmful to a very fragile ecosystem," said Kaitlin Bryson, an Albuquerque-based artist and organic farmer who is helping spearhead the mycoremediation proposal. Bryson, 30, said the idea is in its infancy, and she's not sure exactly how many mushrooms it would take to completely restore the aquifer. "I really can't conceptualize," she said. The group plans to pitch the idea during a public hearing in Los Alamos in early November on a state discharge permit for the lab. The groups contend the permit was approved three years ago without public input. "It's really not a crazy concept," said Peter McCoy, a Portland, Oregon-based mycologist, a scientist who studies fungus, who is helping Bryson with the proposal. McCoy has experimented with mushrooms for about 17 years and has been leading smaller-scale mycoremediation projects for four years. The results can be significant, he said. The technique uses mycelium, the vegetative body of a fungus, which acts as a magnet to extract heavy metals from soil and water. The first step is to grow molds in a material such as agar, a jelly-like substance found in some types of seaweed. The substance is then inoculated with mycelium and grows. The end result is a mycelial "brick" or "bead," which is used to strip away toxic materials, advocates say. The strategy also has been used in the Ecuadorian Amazon, where Chevron is accused of dumping billions of gallons of oil-drilling waste into unlined pits. McCoy sees the chromium plume project as an opportunity to advance the science. "If we are able to move forward, this would be a great proving ground for this technology," he said. "It's really a no-brainer," said Bryson. She led a mycoremediation workshop in April and again earlier this month at the Regeneration Fest: Youth Water Protectors Gathering in Española, where participants explored ways to care for their communities, land and water. She hopes to hold similar workshops in the future. Bryson envisions a community remediation effort in which homemade mycelial bricks or beads are placed at a contamination site as part of an art-like installation. Sharing of ideas. 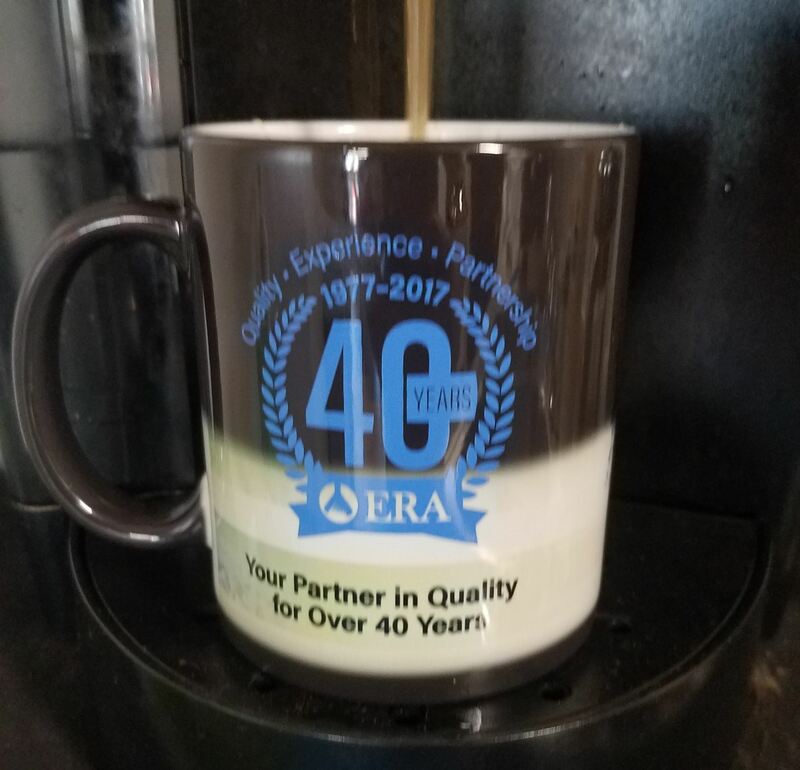 What better way to learn about a new process, method, or way of doing things than in a casual setting over a drink or bite to eat? Solving problems. Our field is not Top Secret. Labs are often reluctant to tell others when things are going wrong, but in this community, people want to help and by opening up and sharing issues you are having in your lab, you can learn other options to solve your problems. Sharing of instruments/reagents/chemicals. How many times have you realized that you are out of a certain chemical and there is no way to get a new batch in time. Maybe that new person you chatted with at the lab nearby can spare enough to get you out of a pickle. New friends. 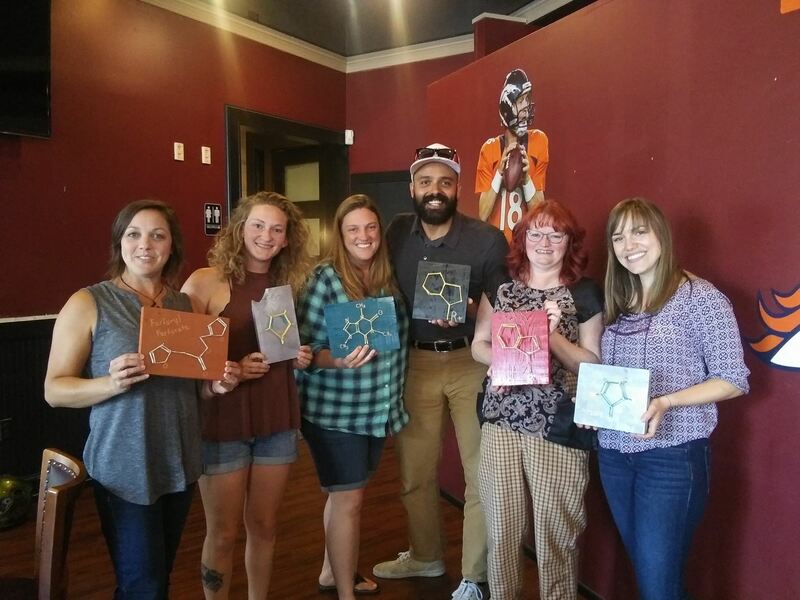 The lab community is full of interesting, amazing people who you may have a connection with beyond the basic chit chat. If nothing else, you now have familiar faces to say hello to at future conferences and trainings. Future job opportunities. Being able to put a face with a name increases the likelihood of standing out in a sea of resumes. Growing your skill set. Networking can open the door to new programs, projects, and professional organizations that can all help you grow in your professional career. What lab do you work in and what analyses do you do? Do you use any contract labs for anything? Do you like them? What analysis do you have the most issues with? Why? Are there any new methods you are considering keeping in-house? What certifications do you have/what auditors have you worked with? What has your experience been with them? What do you anticipate being the biggest challenge for your lab in the coming year? What are the biggest successes you have had? Keep all this in mind when you come to the holiday social this December 6th! We all love to see new faces as well as catch up with those we haven’t seen in a while.